PT Bank CIMB Niaga Tbk - CIMB Niaga or is a well-established privately-owned commercial bank in Indonesia. The Bank was first established in 1955 and initially registered as Bank Niaga. The name of PT Bank CIMB Niaga Tbk officially launched in 2008. PT Bank CIMB Niaga Tbk is a local subsidiary company of Malaysia-based investment bank CIMB Group Holdings Berhad (CIMB Group). At present, CIMB Group is the majority shareholder at PT Bank CIMB Niaga Tbk, with 92.5% of ownership. The rest is owned by general public (7.5%). Headquartered in Jakarta, CIMB Niaga supported by 542 branches, 4,500 ATMs, 174 Multi-Function Devices/MFD, 683 Cash Deposit & Recycle Machines, and 12,782 employees spread in all over Indonesia. In term of financial performance, CIMB Niaga recorded a satisfying financial result in 2017. According to information found in PT Bank CIMB Niaga Tbk Annual Report 2017 as cited by JobsCDC.com, CIMB Niaga successfully recorded a total consolidated net income of Rp3.0 trillion in 201. This number is an 43.0% increase as compared to the net income in the previous year of Rp2.1 trillion. Bank CIMB Niaga booked total net profit of Rp2.98 trillion in 2017. These total net profit figures equal to an increase of around 58.8% compared to Rp1.88 trillion in 2016. Referring to its annual report, total assets of CIMB Niaga in 2017 amounted to Rp266 trillion. This number is up 10.2% from Rp242 trillion in 2016. JobsCDC.com now available on android device. Download now on Google Play here. Please be aware of recruitment fraud. The entire stage of this selection process is free of charge. 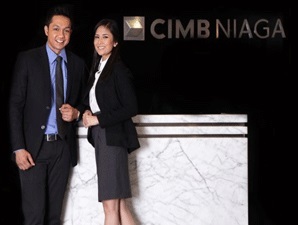 PT Bank CIMB Niaga Tbk - Fresh Graduate Development Program CIMB Niaga December 2018 will never ask for fees or upfront payments for any purposes during the recruitment process such as transportation and accommodation.